This week’s episode of The Adelaide Show, Stories of shopping, summer, and Saturday nights, is an opportunity to remember what it was like growing up in South Australia in the 60s, 70s, 80s, and 90s. Our guides accompanying us on this nostalgic tour are Lina and Don Violi. Lina worked as a cigarette promotions girl as one of her early jobs, and Don has been a hairdresser in Adelaide for more decades than he cares to remember. This week, we have an SA Drink Of The Week from Shingleback Wines in McLaren Vale. In IS IT NEWS, Nigel challenges us on stories about Saturday Nights. 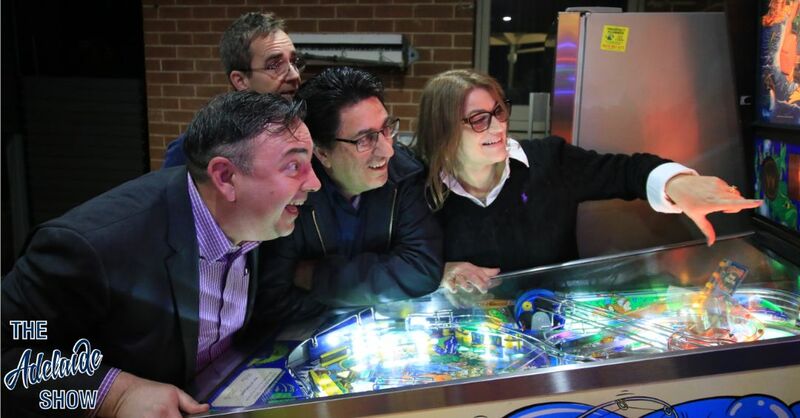 In 100 Weeks Ago, we take you back to our trip to the Game Obsession Expo in Mannum. And in the musical pilgrimage … we have a brand new song from Lost Woods. Lina and Don Violi are two people who’ve been part of the fabric of SA society all their lives. Lina has held a number of jobs for iconic brands, and Don has been a hairdresser to the fashionable and famous since the era of Don Dunstan. So, tonight, we have gathered, towards the end of The Adelaide Show, to spend some time reflecting on stories about life in Adelaide and SA from the 60s to the 90s, relating to shopping, summer, and Saturday nights. Lina, what are some of the jobs you’ve held over the years? Don, where have you cut hair? Let’s start with the old Le Cornu site. Our found out today my folks bought their first bedroom suite and kitchen chairs from their around 1965. Did you ever shop there? Robert Godden pointed out that it had the longest non-reflective window in the Southern Hemisphere, and the Cardinals Book Club guys pointed out that there was an ad with a woman getting on a bus, the bus driver asked Where To, and she replied Le Cornu Carpets please. What was shopping like on weekends? Do you recall most shops closing? Did you know Melbourne Street, North Adelaide, had Saturday morning markets? Do you remember Cravens? It was a big department store on the corner of Rundle and Pulteney Streets, with a reputation for low prices because John Craven would travel to Europe and buy in bulk, directly from factories. Here is a story from the Adelaide Remembers When site: Mum took me with her to the big sale after that fire at Cravens in 1964. I was about 12. The police came on horses to control the huge crowds who were trying to get bargains. There were so many people they were blocking the roads. We were stuck in the middle of the mayhem and the mounted police tried to push the crowd off the road. The crowd was so dense that some people got pushed against the big glass windows, and one (maybe more) broke under the pressure. Some people were badly injured if I remember right. I remember the awful crash of breaking glass and the screams. Anyway, it was too much for Mum and me and we fought our way out of the melee and went for a cup of tea in Cox-Foys cafeteria! Cox Foys. I remember it had an amusement centre on its roof. I see lots of photos of beaches full in the evenings during heat waves. Did you take your family? How else did people stay cool. Would you hit the beach in a car without air conditioning today? This is where we might as well talk about pinball machines. While they were in milk bars and fish and chip shops, they were gathered in lots of places. Why did you buy some? Did you play much? Where? Today we have The Beach House but did you ever go to Downtown? What were the precursors to Downtown. Would that have been Ginos in Hindley Street? conclusion of the meeting. Supper I may also be brought. fast as ever, and this daredevil rider will be hard to defeat. Harry Butler, although married on Thursday night, will again compete. He can be relied on to put up his usual good show before departing, for his honeymoon. Ned Kelly is a rider who has probably gained more placings than any other competitor this season. If he keeps on improving it will be surprising if he is not placed with the back-mark men before long. government last year. With an entrance from the front of the hotel, the 600 square-foot drive-in facility is open from 4p.m to 7 p.m. Friday and Saturday. The facility is manned and includes provision for drivers wanting to hurry through and those wishing to browse. The bottle store will sell wines, particularly featuring those of the Southern Vales, spirits of all kinds, beers — interstate, imported and local — and a range of wine giftware. Also available will be some rare tawny and vintage ports and old clarets and burgundies, including collectors’ items. We opened the vault to go back 100 weeks to our day with the treasurer of the Mannum Show, Gavin Pitman, for the inaugural Game Obsession Expo in Mannum. In part of our story, he explained how getting the expo together was a last ditch effort to breathe life into regionally-based leisure and activities. And our song this week is Cinnamon by Lost Woods, selected by our musical curator, Todd Fischer.